As we approach May 19, I am reminded of the debate over who is the patron saint of lawyers. There are those who insist it is Thomas More, the 16th century English Chancellor who was tried, convicted, and executed for treason when he refused to compromise his religious convictions to accommodate Henry VIII. There are others who insist it is Yves of Treguier, who died on May 19, 1303, and was canonized in 1330. Yves was born in 1253 in Kermartin, a small village near Treguier in Brittany, France. (He is also called Ivo of Kermartin.) A lawyer in both the civil and ecclesiastical courts, he became famous for representing the poor without charge. Some say he inspired modern day legal aid. He became the judge of his diocese and his fame grew when he refused to accept bribes, which apparently were the order of the day. 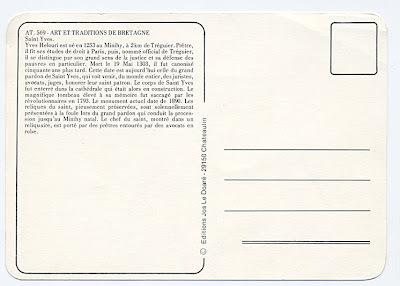 On the third Sunday of every May there is a grand pardon (pilgrimage) in Treguier to honor and celebrate his life. 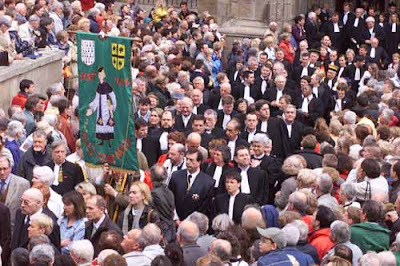 Hundreds of lawyers, from around the world and of different religions, join the procession with thousands of Bretons in attendance. 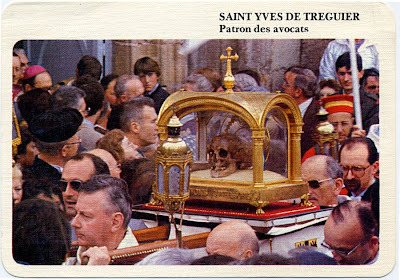 A reliquary with Yves’ skull is carried through the streets to the chapel which marks the place of his birth. The debate over who is the patron of lawyers will not be resolved. I like to think that Thomas More and Yves of Treguier represent two aspirations of the profession: More the principled stand against oppressive government, and Yves the provision of legal services for the disadvantaged and needy.